This was the first time I had followed the Flyers south of the border, so was interested to see how many of my fellow Fifers also made the long journey. The answer was: Quite a Few. A good couple of hundred at least it seemed. I guess the fact the Flyers had another away fixture locally (in Nottingham) the following evening would have enticed a few folks down to make a weekend of things. 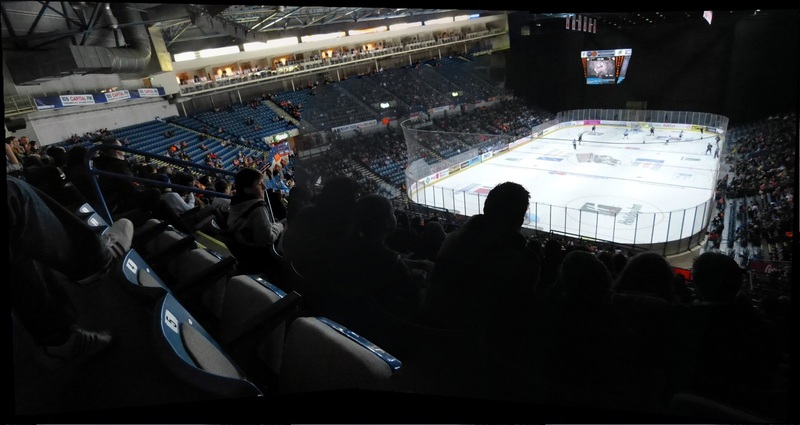 This match took place at the Motorpoint Sheffield Arena, a whopping construction on the east of the city, which can apparently house as many as 13,500 folks. But I am surmising this would be for concerts when the floor would be filled with seating. I was unsure what to expect of the Flyers this outing, as they were presently being infuriatingly inconsistent. Early in February they had hosted Edinburgh and won 7-1, but then had bafflingly lost the return the following week by 7-2. 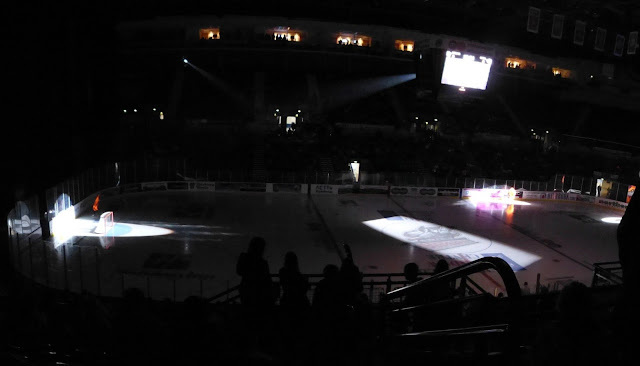 In between these ties Fife had enjoyed a rare win over one of the big players: Cardiff Devils. This one, however, went true to form with Sheffield taking control following two early scores, rarely being troubled by the Flyers’ attack. 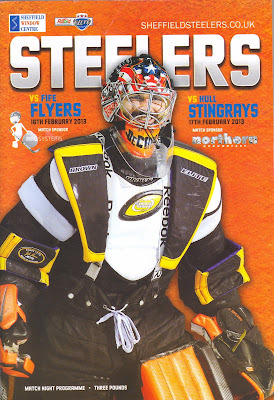 The home lads’ dominance when never more clearly demonstrated than during a short spell when due to Steelers’ misbehaviour, Fife enjoyed a two-man advantage. But even with this state of affairs they were unable to create any clear-cut opportunities, the puck just seemingly passed back and forth across John DeCaro’s goal as the seconds ticked by. Todd Dutiaume (I think it was) did p’ting the puck off the frame of the home goal later in the second period, but that was a close as the visitors’ came to scoring. Neat footwork by the official. Those dedicated Fifers who had made the trip down mostly congregated in this corner. I take my hat off to you All. as the most bizarre sporting kit I have ever seen. Wow, some effort went into these. Very interesting & I bet you're a fair few quid lighter after t'Millers n t'Steelers games. I'm a life long Miller & season ticket holder. I used to go to the occasional Steelers scrap too until 2010. Did you ever visit Don Valley Stadium for the footy or RL? I did not, as it never really felt like a "real" footy venue. Would have loved to have seen a match at Millmoor, though. Perhaps RL may find it's way to the venue at some point in the future, although from what I hear the present owner keeps falling out with everyone.